See the current WSIA Board of Directors list for 2019. United States Coast Guard Marine Safety Alert -Inspections and Compliance Directorate- "Hazards of Parasail & Watersports Passenger Transfers"
Current (version 17.1) product warning labels are now available. A username and password is required to download the label graphic files. Please contact info@wsia.net for more information. Download the art files and graphics for the Wake Responsibly campaign. There are Master Files, Print PDFs and JPGs for web use. Email info@wsia.net with any questions. Active WSIA members can use their annual member password to download an XLSX spreadsheet of all currently active WSIA members. Contact us with questions or problems accessing the file. The Watersports Responsibility Code poster, outlining the 10 things all watersports enthusiasts should be aware of when enjoying towed water sports. 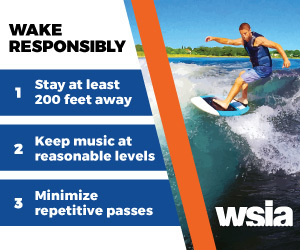 Use this online form to request a Wake Responsibly launch ramp sign for your local waterway. Have a specific question about boating in your state? Boating safety contacts for each state are available on individual state pages. Click on your state to find the boating law administrator and others involved in boating safety education, law enforcement, numbering & titling and other boating program areas. The Refusal of Care / Contact Card form is available as a password-protected download for all active WSIA members. On-site safety signage for Marinas, Dealers, Shops and other water sports retail locations. Active member username and password required. The 2015 Survey of Sales is now available to all active WSIA members. Contact us for help with the download. Active WSIA parasail members can now download the Crash Pack using their annual password. This Safety Alert serves as a reminder to owners, operators and crewmembers working on all parasail vessels to review equipment instructions and usage limitations. The Wake Park Safety Video is available free to all active WSIA Wake Park members, as a digital download or DVD. Email info@wsia.net for more details! Active Boat Manufacturer members can download a ZIP package of boat warning labels and manual (password protected). Please watch and share this valuable safety video for towing inflatables, produced by the WSIA. Safety and etiquette is outlined so that everyone will enjoy a fun and safe day on the water.